Colorverse inks are new so naturally distribution is an issue. Shipping has improved since I made my order last year but it's still not great but there is now Squishy Ink's (Krystal's) Hippo Noto which retails the inks and I'm sure there will be more to come EDIT: in Australia Desk Bandit sell Colorverse inks (15% off first order and free shipping thresholds for domestic and international sales) EDIT2: Vanness now have Colorverse inks as well!. These inks run for US$30 from the Colorverse website and ship from South Korea and shipping for one bottle is US$23 to get to Australia (and is $3 more for the US) and US$78 for 10 bottles so clearly the more bottles you buy the more economical shipping is. The reason, however, that shipping is so pricy (and obviously also a contributing factor to the item cost as well) is the large packaging and that you get more than just a single bottle of ink. In each substantially sized box you get one 65ml (2.2fl. oz.) bottle and one 15ml (0.5fl. oz) bottle. 65ml is already generously sized and the extra 15ml bottle (which brings the inks up to Diamine glass bottle sizes) is certainly a unique inclusion. Additionally you can a novelty cardboard pen stand, a bookmark, a pamphlet, and, curiously, a branded napkin. What is quite fun is 18 stickers that are also included. There is a a fair amount of empty space in the boxes so while I like the uniqueness I fear that the additional cost of the second bottle and the other extras driving up the price might hamper sales. Hopefully not! I organised a little group buy when I bought my inks and we swapped all our 15ml bottles so while I only bought 3 boxes I ended up with a nice variety of 6 inks. If you can organise something like that I highly recommend it! The new Season 3 "Multiverse" inks (of which I have ordered two) have two different inks in the box (often with the smaller bottle having some interesting characteristics). I think this approach is unique and very interesting and indeed more desirably than two of the same ink. 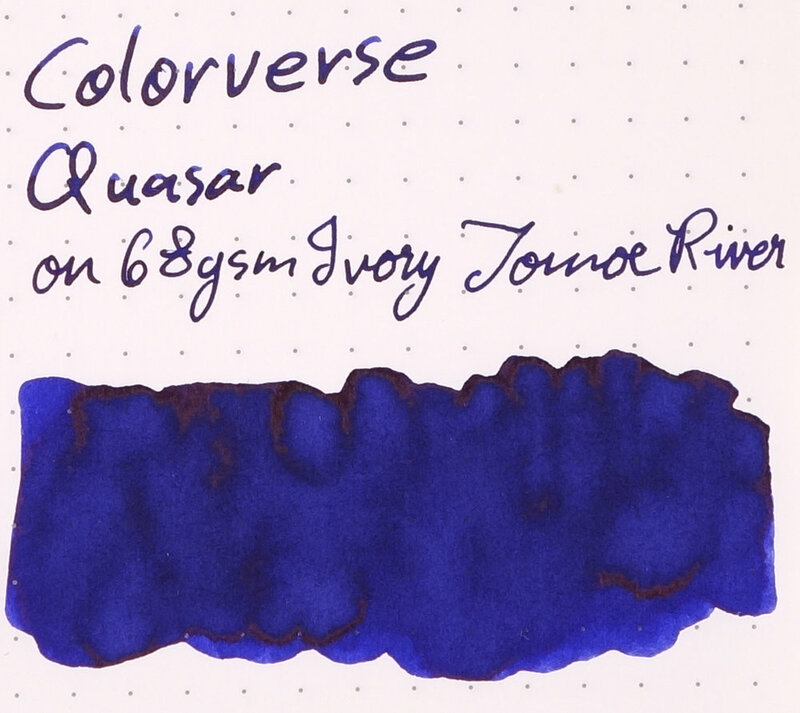 Colorverse Quasar is a rather neutral blue. It doesn't stray too far teal or purple but if it does lean one way it's toward purple. It's a very rich blue and somewhat dark but definitely not a blue black. The ink performs very well on fountain pen friendly paper but there's some feathering on copy paper, composition book paper and Leuchtturm1917 paper (but I don't blame the ink in these occasions). The ink is very nicely lubricated and very nice and wet in my extra fine Pelikan M200 and my rather wet medium Sheaffer Legacy II. Some smearing on both Rhodia and Tomoe River with more from the latter. The ink reminds me a lot of most Sailor inks: wet, lubricated, sheeny and richly coloured. I love writing with this ink like I love writing with Sailor inks. This ink has a golden sheen which is somewhat unusual for a blue ink. I've only noticed gold sheen in purples or purple leaning blues so it makes sense that this ink leans very slightly purple. This ink isn't a super sheener but it does have a decent amount and there is a subtle amount of sheen on Rhodia paper. Chromatography is very uninterestingly just the colour of the ink. Dry times are pretty slow on both Rhodia and Tomoe River. Not pictured but the ink does not have good water resistance. I selected four somewhat similar blues and one blue-black for comparison. Diamine Majestic Blue, Diamine Sargasso Sea, Private Reserve Electric DC Blue, KWZ Chicago Blue, and Kobe #38 Kitanozaka Night Blue. Majestic Blue Is a little lighter and much too green leaning. Sargasso Sea is too purple and a little flatter. Electric DC Blue is again more green but not that much so but is a similar darkness. Chicago Blue lacks the vibrancy and saturation of Colorverse Quasar. Kobe #38 is there to show how this ink is not a blue-black. It might be dark but it's much to vibrant and saturated for a blue-"black". On Tomoe River Majestic Blue is again too green leaning (but not as obviously). Sargasso Sea is actually pretty comparable on this paper. Electric DC Blue is rather light here and so isn't as similar. Chicago Blue is a little more vibrant now but is an even more neutral blue and lacks the purple. Diamine Majestic Blue and Private Reserve Electric DC Blue both have a red sheen that is completely different from that of Colorverse Quasar's gold. KWZ Chicago Blue has a muted silvery sheen. Diamine Sargasso Sea has a similar gold sheen (and is even slightly more sheeny). I have absolutely fallen in love with Colorverse inks. They are unfortunately pricy but hopefully time will allow more distributors which might help with prices. The bottles are a blobby round shape but the little point makes them unique and the small bottle is definitely cute. The ink writes magically and has very good performance on fountain pen paper. I very highly recommend grabbing a bottle if you can (and a group order is well worth it, especially if you can swap the 15ml bottles! You can buy the ink from the manufacturer, from Pen Chalet (with very affordable international shipping rates! ), from Vanness Pen Shop, or from Hippo Noto.